On the road from Hubbell to the Calumet Golf Course, there are two parking lots. If you park at the one closest to Hubbell and follow the trail a short distance, you come to the gorge cut by Hungarian Creek. 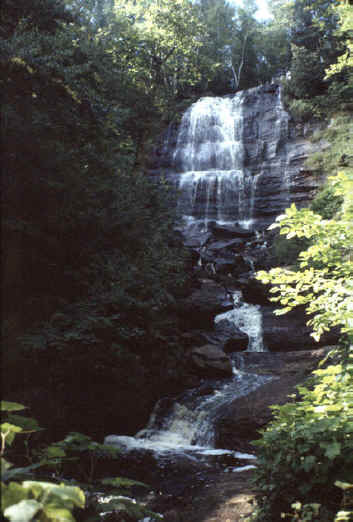 In 1981, when this picture was taken, it was possible for the sure-footed to walk down into the gorge along its north side. The trail was sometimes slippery and angled sideways into the gorge, but I made it to the foot of the falls. I took a lot of pictures with two cameras, because I knew in my heart that I'll never get down there again. If you walk along the top of the gorge, or go on to the second parking lot, you come out at a dam above this falls, with a nice pond backed up behind it. It's pretty there, too.